Wouldn't it be nice if we could have carpets, and stairs, together? My idea is to have stairs made equippable with carpets, by right-clicking on them with said carpets. The reason for the lack of the bottom line of carpet at the front is so the texture will not overlap with other carpets (especially if there is a different-coloured carpet at the foot of the stairs, but this could possibly be detected: If there is carpet at the bottom, miss out that line, and if there is not, it could reach the bottom). It would be possible for all types of carpet and stairs (wood and stone-related) to be used, and maybe even slabs with a similar way of fitting in. Yeah, this would be nice. Not super urgent though, and at this point I really don't like this subforum so I'm not going to expand on this. I absolutely support this. it would look so much better for building and a homely substitute for wool stairs. Full support, this suggestion would be very useful. This would present a few problems. Would the carpet be a separate block, or would it be the same? Would the carpet go up staris or not? And have you even begun to understand how many new blockstates that would require? If the carpet was on the same block, there would be 31 (different types of stairs) * 17 (colours of carpet + 1) * 4 (direction) * 5 (curving) * 2 (up or down) = 21,080 different blocks. This math isn't entirely correct. As in not correct at all. The direction, up/down and curving are actually implemented using Block States, which are not separate blocks to my knowledge. (You forgot waterlogged in your list) However, the 31 different types of stairs are different blocks entirely. 31 variants of stairs is a lot to carpet. The easiest way to remedy this specific problem is to reduce the number of stairs requiring carpets to just wood or cobble. Let's use wood since carpeted stairs sound incredibly useful for furniture and not a lot of comfortable sitting furniture is made from stone. That means we're actually looking at 16 colors * 6 wood variants, or 96 new blocks. That's still a lot of creative inventory spam, but it's not undo-able. Better yet would be if you could right-click on stairs with a carpet rather than place these in the creative inventory. Still, that's a lot of blocks to exist. I agree that's a large amount of blocks, and I don't like large amounts of similar blocks either. Maybe a better way to do this would be to create 16 blocks with a block state that says what wood type it is? Looking at the Minecraft Wiki, there are quite a few blocks which would require more than 4 bits for all the variants. Chorus Plant, for example has 26 or 64 different variants, far more than the 16 that the original 4 bit system allowed. Stairs appear to use 80 different variants, which I find odd since I thought the inner/outer shape was just determined through rendering code and not saved in the world. So 17 (colors plus uncarpeted) * 6 wood types * 80 current stair variants = 8160 block states. That's a lot of block states, better yet is if we split the colors into 16 new blocks. Now it's 80 * 6 which is 480 different block variants created by block states. I have no idea if this is possible or not, since the documentation on block states is unclear. 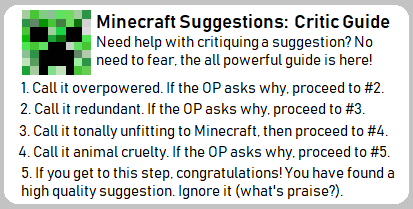 I do like this idea though, and I kinda hope Mojang finds a way to implement this. I would take 96 hidden blocks if it meant I could build with carpets on wooden stairs. Support. I'd argue that these really don't need to be in the creative inventory. Anyway, support. These blocks would be great for both colored stairs and for couches or chairs. Or the stair carpet could just act like a regular carpet, and on the blocks above the stair. Would be a really nice addition. People would be able to make grand staircases, along with other things such as couches and such. Depends I think, can we craft it, place it onto the stairs with an interaction. I don't hate the idea and it would be tricky for all stair variants after a while but either way I like the idea but trying to think of it both sides here.